Today is Samuel Adam’s Cicerone Test. A cicerone is an official beer connoisseur who has been officially certified by the Cicerone Certification Program. Samuel Adams offers their employees training within the company to pass their cicerone program. As a reward, the company generously gives them a custom made blazer (made by us), commemorating their achievement. Just like our other garments, these are custom made to each person. A few days before the exam, our expert style consultants go to the Boston Beer Company’s Headquarters at the Design Center to measure each potential cicerone. You need more than just love for craft beer and being able to handle beer so hoppy you can chew it (gross). Having a beer belly, drinking copious amounts of Sam Adams beers and going on multiple brewery tours doesn’t get you into the club either, becoming a cicerone is not easy. There were a handful of candidates that were getting measured for a second time and they’ve made the test more difficult. Some students say they recommend opening their books 4 months in advance, otherwise, study for as long as you can. One guy decided it was best to cram everything in, in 3 weeks to which another candidate scoffed at and says there’s no way he’ll pass. Employees fly to Boston from all over the country to take this test with a few cram days beforehand for review. Different brew samples are laid out in front of them mixed in with good batches, bad batches and stale beers; ingredients need to be identified and it’s freshness pinpointed. 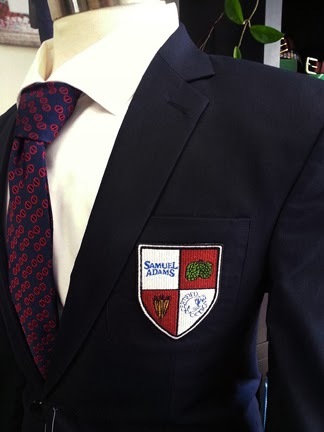 When all is said and done, they get a beautiful custom navy blazer with the official club patch with a monogram of their choosing on the inside. There’s nothing like local brews and local fashion love affairs. And for those of you who are curious, there was a healthy amount of woman candidates present, it’s not just all men. I’m excited to see how many blazers of the 25 people we measured get made. Best of luck to everyone! Interested in getting custom blazers for your company? Have a team sport coming up that you need blazers for? Like the Henley Royal Regatta? Contact us at info@9tailors.com!